THE REVIEW: I’m going to avoid making promises to write more reviews that I don’t keep and just start by saying happy 2018! 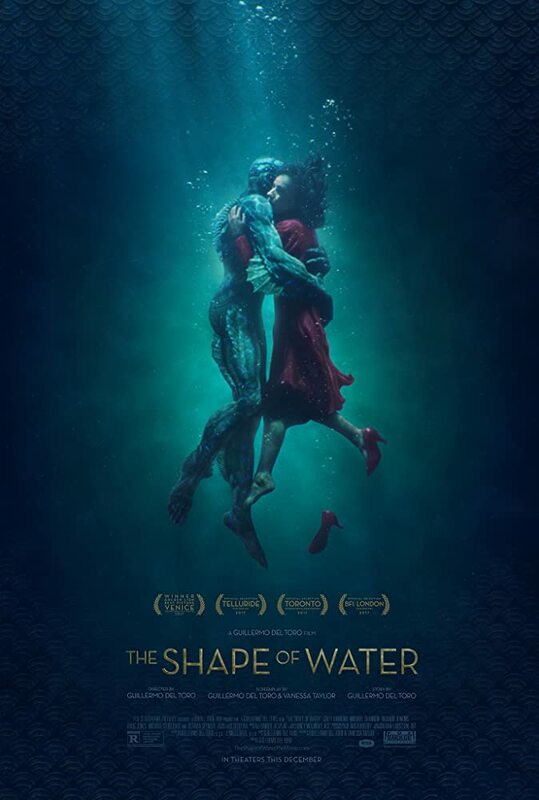 I saw The Shape of Water a few weeks ago and kept meaning to write a review; now it has been nominated for a Best Picture Oscar so it’s kind of mandatory at this point. Part of the reason I didn’t write down my thoughts right away is that it was hard for me to write about this film. Lots of people I spoke to asked me what I thought and I ended up developing a standard response that came about spontaneously — shrugging my shoulders and saying, “I liked it,” in a very meh tone-of-voice. Somehow I thought waiting two weeks would help with a formal review, but that doesn’t seem to be the case now. Sally Hawkins’ acting is superb, one of the best performances I saw of the year (though that list is admittedly small), and deserving of her nomination for Best Actress. Despite having only seen del Toro’s Pacific Rim — which while fitting with his style is still far from Pan’s Labyrinth — I could readily identify his unique voice and really appreciated the subtlety he brought to the story and the visuals. Fantastical realism comes to mind as a way to describe it; crazy out-there would be an exaggerated, though still apt, as well. David Hewlett’s (who I know from the Stargate Atlantis series) supporting performance was a plus for me and Michael Stuhlbarg also delivers a well-rounded acting job. THE TAKEAWAY: Sure, call it that. A lot of people love this film a whole lot and have strong opinions about it, opinions I cannot really disagree with. However, my overall takeaway for The Shape of Water can still be summed up with “meh”. I had been wavering between three and four stars because again, despite my blasé attitude I did like this film. But after never really having a good answer besides, “I liked it” when people asked me my thoughts, I landed on three stars being the most appropriate. Opinions will vary, and I would love to hear from those of you who did love the film why; what are the specifics that drew you in and took it to that next level for you. My advice is give it a throw, see what you think. I’ve been losing my authority on what I think the best films of the year are after I stopped seeing a lot the year they’re released, but I won’t disagree with it being nominated for Best Picture; and I strongly agree with the nominations for Hawkins and del Toro in their respective categories.